Squash and pumpkins are frequently direct seeded, but for early markets it may be profitable to transplant, especially expensive hybrid seed. Bare ground and plasticulture systems can be either direct seeded or transplanted. Do not plant squash or pumpkin until daily soil temperatures are at least 60°F. Transplants may be used to ensure uniform or complete stands, increase yield and to increase the likelihood of early harvest. Prior to transplanting, the plants can be hardened by placing them outside in a protected location. Seed about two to three weeks before transplanting into the field. It is common to transplant into the field at the three- to four-leaf stage, but some growers get better survival by setting out younger plants (cotyledon to first true leaf stage). Transplants are quite subject to root injury and should be handled carefully with as little disturbance as possible. Those transplanted from the greenhouse before the frost-free date should be covered with hot caps or row covers or protected with irrigation (see Irrigation, page 18) to avoid freezing injury. Transplanted pumpkins and squash generally have reduced root systems commpared with direct-seeded plants. Transplants should be used only in irrigated fields. Pumpkins can also be produced using a strip-till or no-till system. In such reduced-till systems, seeds are usually planted into the stubble of a killed cover crop or harvested small grain. Reduced-till systems provide erosion control, help retain soil moisture, improve soil structure, reduce weed and disease pressure, provide cleaner fruit at harvest and may facilitate planting and harvest operations during wet weather. Pumpkin and squash require bee activity for good fruit set. Fruit set in winter squash and pumpkin takes place largely over a two to three week period, hence the importance of bees. Inadequate pollination results in poorly shaped fruit, as well as excessive blossom drop. One hive of bees per acre is recommended. If Euopean honey bees are not available, bumble bees are a reliable alternative and are commercially available. The practice of saving squash or pumpkin seed for planting the following year is not recommended. Since bees can carry pollen for a mile or more, isolation of fields from other types of squash or pumpkin is rarely possible in the New England area. Several factors other than bees and pollination may affect fruit set. Pumpkins and squash have separate male and female flowers. The numbers of female flowers, which produce fruit, is adversely affected by prolonged periods of high temperatures of (7+ days above 90°F day and 70°F night), dry conditions just prior to and during bloom and excessive shading from the plant canopy. Sometimes low yields associated with lack of female flowers can be avoided or minimized by making several plantings over 2 to 3 weeks, planting several varieties, timely irrigation, avoiding excess nitrogen and spacing pumpkins farther apart to help reduce shading. 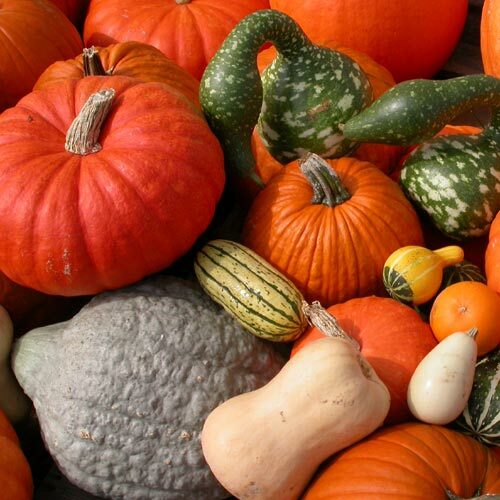 Gourds can be grown on the ground or can be trained to grow on a trellis, fence or arbor. For commercial production they should be grown in rows or hills like squash and pumpkins. Gourds can be grown in a wide range of soil types but mature earlier and color better on sandy soils or sandy loams that drain well and warm up early in the spring. Gourd seeds can be purchased as a mix or can be ordered from some seed companies by type or form (warted, spoon, crown of thorns, etc.). Seeds can be saved to develop mixes but plants must be isolated from other cucurbits. Check days to maturity to be sure that growing season is long enough.